Earth Day is almost here! And whether you’re the gardening hippie type, or brand new to celebrating, this day is for all! Earth Day is this Monday, April 22nd, and is a global holiday that asks us all to take a step back and look at our environmental impact. It’s a great time to go green! Re-dedicate yourself to environmentally friendly lifestyle choices or volunteer for local environmental organizations. Here at Soul Strong Yoga, we do our best to reduce our waste through providing compostable cups and reusable hand towels. However, we’ve got the magnificent Jackie Cawthon, also known as @thegirlwiththecarrottattoo, on our team to inspire us to always go the extra mile! I interviewed her about the increasingly popular zero-waste movement, as Jackie is always deepening her sustainable lifestyle. Check out the interview below for inspiration on how to reduce your daily waste, buy second-hand, and more! CLARA: What exactly is the zero-waste movement? How did you become interested in adapting zero (or low) waste practices into your life? JACKIE: I'll start by saying, I wish it was more popularly known as the "less waste" movement, due to the discouragement of how difficult a zero-waste lifestyle is to live, but I understand that ideally, we do want to eventually live in a 100% zero-waste world. I think the zero-waste movement is about making more conscious decisions about what you buy or accept and also how you dispose of things that you no longer need or want. We are working towards loving this planet a little more, by being more mindful of how we treat it. I think the first time I was ever exposed to this idea was when I watched an interview of this woman who kept all of the trash she produced in a whole year, and it all fit into a small mason jar. I was absolutely blown away that that was even possible, seeing that I created more trash in a day than she did in a year. Honestly, this didn't encourage me enough to actually make any changes in my life right away, but I was immediately actually aware of the trash I was creating. It was not until some time last year that I got a lot more serious. Seeing photos of beautiful beaches destroyed by empty Hot Cheetos bags and single-use cutlery broke my heart. I noticed even in my own city, trash cans overflowing with waste. Trash trickled down the streets. It’s repulsive. And even worse, I realized I am part of the problem. I decided enough is enough. I no longer want to participate in the destruction of our home, so I started doing research on zero-waste and found so many helpful hints on Google, Pinterest, and Instagram. CLARA: Why live a zero (or low) waste lifestyle? What are some of the benefits, both for the environment and for you? a. Cost: I've saved a ton of money by cutting down on paper towels, making more food at home, and buying only what I need, instead of making impulse purchases. b. Power of making a difference: It just feels good to know you are changing the world. d. High quality: When you give each purchase you make a little more thought and consideration, you will usually go with high quality items that will last longer. e. Avoid chemicals: You'll begin to notice how much crap is in everything we buy! When we make our own, or opt in to buying local, there are usually fewer fillers and toxic ingredients. CLARA: What are the easiest ways to reduce waste in daily life? What are some of your other favorite ways to reduce waste? a. Second-hand shopping: I've always loved thrifting and treasure hunting, so this is a breeze. If I check all my favorite second-hand stores and do not find what I need, I will ask friends, and as a last resort, I will buy new, high quality items. Favorite stores include: Revival Vintage, Uptown Cheapskate, Goodwill, Room Service Vintage, Savers, Plato's Closet and Salvation Army. b. Reusable bags: Grocery shopping is so much easier with your own sturdy bags. I can get at least 4 or 5 plastic bags worth of groceries into just 1 of my reusable bags. I try to have at least 2 in my car, but if I forget, and only have a few items, I will refuse the plastic bag and just carry my items out in hand. c. Ceramic coffee mug: I love Starbucks. I try to make my own coffee at home, but occasionally I'll treat myself to a cup of joe in my reusable ceramic starbucks mug. d. Stainless steel straws: AMAZON! I keep a handful at home and one or two in my bamboo travel cutlery set. e. Paper towel replacement: I use worn out hand towels to clean up messes in my kitchen and have switched to cloth napkins for meals instead of paper towels. CLARA: Any last tips? Things for folks to remember as they move towards reducing their waste? JACKIE: Don't stress about being perfect. There's no need to beat yourself up EVER. This movement is all about love and respect - not only loving and respecting your planet - your home - but showing that same love and respect towards yourself. Just do your best and know that you are making a powerful difference. Inspired to make a difference? Keep reading about the less-waste movement by checking out the links provided below. Ready to learn more from Jackie? She teaches the Beginner’s Flow at 6:30 PM at Soul Strong Sanctuary and 8:00 PM Power at the Soul Strong main studio every Thursday. Jackie also has an inversion workshop coming up! Learn to take flight and sign up HERE! All photos in this post are by Jackie Cawthon. Follow her instagram @thegirlwiththecarrottattoo. Did you know Jackie is also a yoga photographer? Check out her gram and schedule a session with her! Release What’s No Longer Serving You! The Moon Magic and Gong Flow Series. As I sat typing out the following interview with Soul Strong co-owner and yoga instructor Sepideh Jafari, I remembered that today (March 6th) is the new moon. The timing could not have been better to manifest great vibes for our upcoming Moon Magic and Flow Series! Sepi and Jessica Cross, another beloved Soul Strong instructor and sound therapist, have put together an incredible series that will guide you through yoga asana, sound therapy and ritual for two full moons and two new moons in 2019. You can purchase the whole series, HERE and attend all four events throughout the year at a discounted rate. You can also purchase the passes individually HERE, starting with the upcoming Crow Moon event on March 22nd. The Moon Magic events will be transformational, as we draw on the powers of the moon to guide us. Check out the interview with Sepi below to learn more about the events, as well as the magic of the moon! 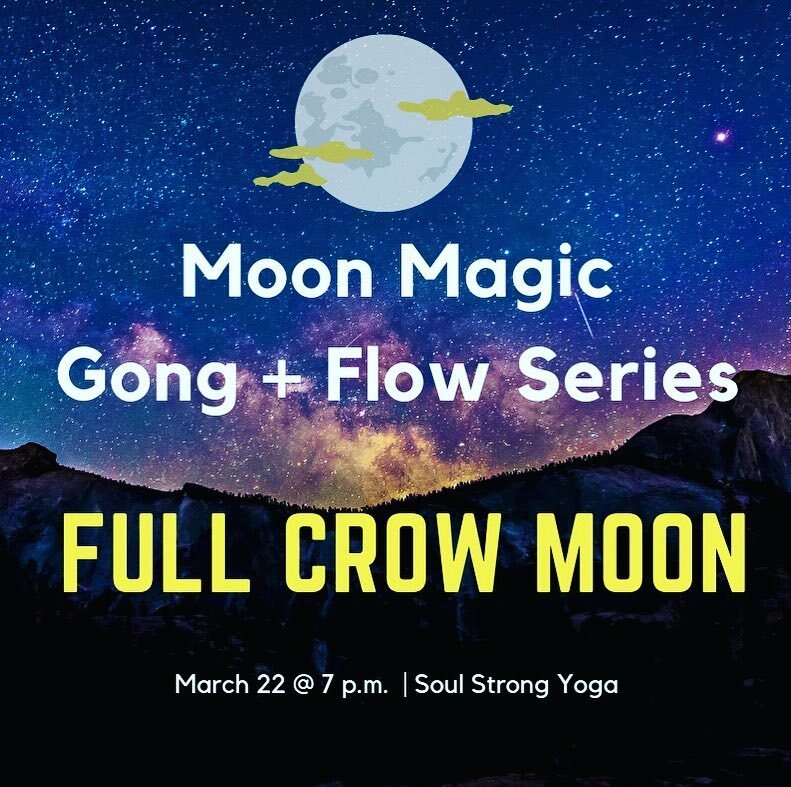 And be sure to snag your spot for March 22nd’s Crow Moon yoga experience! Tell me about the powers of the moon. Why is being in tune with it important to the yogic lifestyle? Sepi: The moon represents a lot- feminine energy, the tides change with the moon. We do sun salutations everyday but moon salutations get overlooked. By taking the time to tune into the moon, it’s really just another way to take a step back and evaluate yourself. It’s Svadhyaya (self-study), which is one of the Niyamas (Internal Practices) of yoga. What’s the difference between practicing yoga on a full moon verses a new moon? Sepi: The Full Moon is when you practice letting go of things that are no longer serving you, cleansing. The New Moon is about bringing things in, manifestation. What inspired you and Jessica to create this series? Sepi: I love moon manifesting. It’s a great time to set an intention and manifest more of what you want to bring into your life. And I love Jessica’s sound work and wanted us to do more with the gong. The gong has a really strong vibration so it’s perfect for something like this. By doing a series, we get to reflect in all four seasons when there are big changes and your focus changes. The first one, the Crow Moon, aligns with the Equinox. What can students expect when attending the series? Sepi: When folks arrive, we’ll give them pen and paper to write what they want to release and bring in. Then we’ll move through Moon Salutations - it’s more legs and standing, not like a vinyasa. Then we’ll get everyone settled in a comfortable, restorative savasana. From there, Jessica will play the gong and chimes. Afterwards, there will be a warm beverage- golden milk or a cacao drink. Students have the option to stick around a little longer and go outside for an optional palo santo cleanse. Want to learn more about Yoga and the Moon? Check out the following links below! And don’t forget to sign up for the upcoming series HERE! Wondering why a Crow Moon is called a Crow Moon? Read about the history HERE! Yoga Nidra. The Yogic Sleep. We are so excited to bring this practice to you through our upcoming yoga workshop with Todd Cline. Our regulars may know Todd for his fiery Power classes or the sweaty HIIT Fusion Saturdays. However, Todd is a great example of a yoga practitioner that lives out a well-balanced practice. While it’s important to move the body and stay strong for all of life’s ups and downs, rest and recovery are equally necessary. However, sitting still in what most of us traditionally know as meditation can be difficult! It takes a lot of practice to be able to sit with yourself, in silence, and not get caught up in reeling thoughts. While the practice of seated meditation is certainly worth it, I highly recommend easing your way into the world of meditation with Yoga Nidra! Or supplementing your meditation practice with it. Yoga Nidra, is both exponentially more restful but also incredibly accessible to the general population! The scripted, guided meditation practice brings the mind to surrender towards restfulness. And you’ll be set up in a comfortable, supported Savasana for extra coziness! When I think of Yoga Nidra, I almost think of it as “leveling up” your practice of rest. Yoga Nidra feels like pressing a reset button in a way that a full night’s sleep doesn’t always accomplish. From Savasana, the guided meditation of Yoga Nidra lands the brain between alpha and theta waves. From this state, deep healing of all kinds can happen. Some of the most common benefits are stress relief, decreased anxiety, improved mood, and an easier time sleeping at night. However, this practice is expansive and has been proven to assist with resetting negative thought patterns. We all carry around samskaras (scars of the mind), simply from the trauma of everyday life. Consider deepening your restful, meditative practices next time you feel something’s getting in your way. I promise you won’t regret it. You can join Todd on Sunday, March 10th from 3:00-4:15 PM for this rejuvenating experience! Sign up HERE. For more information about Yoga Nidra, check out the links below! Achieve Neck and Shoulder Health Now! Simple Solutions for Tension and Stress. Are your motivations in taking a yoga class ever fueled by a need to relieve tension? Or quite possibly to relieve stress? Do you often find your stress creeping in as tension, rising up to the neck and shoulders? I learned in the interview below with Josephine Ashford, yoga instructor and massage therapist, that the experience of tension and stress usually go hand in hand. And that most of us are caught in a cycle of stress leading to tension and poor posture, which then leads to self-shaming and stress about our poor posture, which leads to worse posture which leads to....catch my drift? However, Josephine’s holistic, yogic perspective around healthy posture strips away the shame and helps us work towards a pain-free life with self-compassion. The upcoming workshop, titled My Neck and Shoulders…!, gave me the opportunity to interview Josephine and dive deeper. Be sure to check out the interview below, and then snag your spot by signing up HERE. Join Josephine on Sunday, March 3rd from 3:00-4:30PM at our main location, Soul Strong Yoga, in downtown Round Rock. What are some of the biggest benefits of taking time out to focus on your neck and shoulder health? --Learning to actively prioritize your own well-being—this is self-love and compassion. You’re taking care of an issue that is causing you distress. --Alleviating physical discomfort and range of motion limitations. Staying more comfortable and mobile in your body on the whole. --Prevention and slowing or stopping the progression of postural dysfunction. The impact of shoulder and neck problems is not isolated, but concurrent with, or predictive of, future issues in other parts of the body. What inspired you to teach this neck & shoulders workshop? These statements are usually accompanied by an acknowledgment that this is a common issue. Most of us are all too familiar with this type of tension and even pain, but many people don’t know exactly what can be done about it. I often hear clients and students berating themselves for not having better posture, which is not psychically helpful or kind to self. And I hear that they try to “sit up straight,” but know they fail all the time. I see people needing to better understand what is happening in their bodies and why on a deeper level. I see them needing some concrete and accessible ways of starting to change their thinking about postural health (starting with not calling it “bad” or “good”), physical and daily living practices that can start them on a path to a healthier, easy posture, and more body awareness and presence—this is also strongly related to stress management, habit change, and a great use of mindfulness. What should students expect when signing up? How will yoga be tied in? Students can expect to gain a deeper understanding of their postural health, learn simple exercises and stretches (to do during the workday, for example) that will start to move them into having a more natural posture (and thus feeling so much better). They will learn how to go about different activities of daily living (particularly use of screen devices and sleeping positions) in ways that promote healthy posture and movement. We will do an asana practice of some key poses for the neck, shoulder girdle, and back (and what to focus on while in them, posturally) that help to develop the balance of soft tissue strength and functional flexibility, as well promote maintenance of optimal joint movement (ie: the vertebral joints). The asana in this workshop will be accessible to beginners, and modified as needed. We will also share a conversation about habit change, stress manifestations in the body, and a somewhat guided mindfulness meditation. I am very excited to teach this workshop, and grateful for the opportunity to spend purposeful time with everyone there. One of my greatest passions is to help people learn how to live easier in their bodies. Namaste! Want to learn more about Yoga for the Neck and Shoulders? Check out a beautiful post on love, self care, and ahimsa with yogi and yoga teacher, Jill Birt. Self-love is something we cultivate inside of ourselves and it takes some work. It takes asking yourself some tough questions and prioritizing your well being in all ways- body, mind and spirit. Instead of unsustainable extremes and impulsive purchases, we can cultivate daily self-love through simple, daily acts of self-care. Celebrate Valentine’s Day with yoga, self-care, and Thai Massage at Soul Strong Yoga! Are you a yogi interested in yoga teacher training? Come check out our 200 hour yoga teacher training at Soul Strong Yoga! Our certification program will focus on Vinyasa Flow Yoga. We are located in Round Rock, Texas, outside of Austin. We will also explore other types of yoga, such as meditation, restorative, Yin Yoga, Power, and more! The word is out: we’re hosting another yoga series. This time, it’s all about yoga for hips! Nickie Hebert has been hard at work designing a four-week program cleverly called, Hip Hip Hooray! I recently had the privilege of taking a peek at Nickie’s notes, and let me tell you- this is one you do not want to miss! From her background in ballet, to certified yoga teacher, Nickie’s knowledge of the hips goes beyond what you can cover in a Flow yoga class. Over the course of four weeks, she’ll be offering up a weekly series that will help you get to know this area of the body in new and fun ways, as well as sustain hip health for years to come. There will be yoga practices to both strengthen, open and stabilize the hips, as well as education around anatomy, common hip issues, and more! Everyone has a different approach to the New Year. For some, it’s all about the New Year’s Eve party: celebrating the past and moving into the future with some fun! For others, January 1st, 2019 rolls around and it’s just another day. Here at Soul Strong Yoga, we’ve got our eyes set on manifesting our dreams for 2019! While talk of New Year’s resolutions may be rampant and overwhelming this time of year, we’re ready to redefine the flaky resolution. By diving deep into what it means to set meaningful intentions and realistic goals in the interview below, we learn how to move towards the future we want to see. Want to nourish your brain and body? 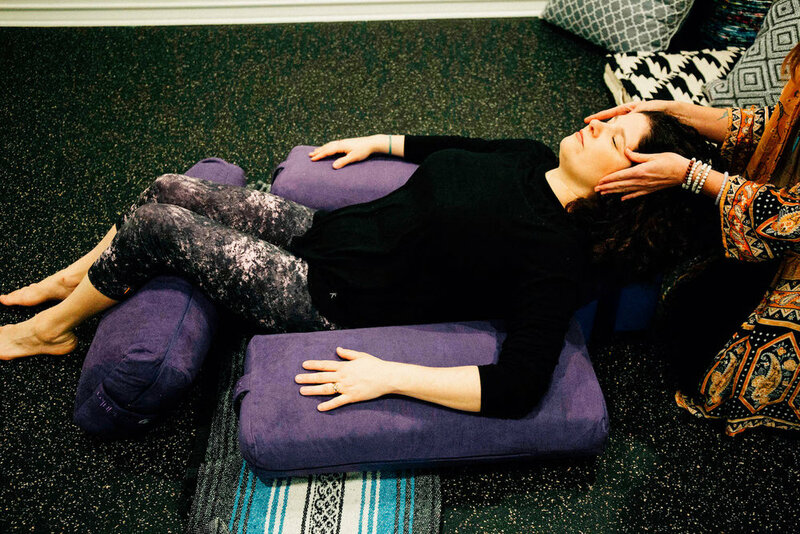 Read all about Sound Therapy and Yin Yoga with Stress-less guru, Jessica Cross! Check out our interview with sound therapist and yoga teacher, Jessica Cross. Jessica is back with a crowd favorite at Soul Strong Yoga: the sound bath. And this time, it’s been combined with a Yin Yoga practice to start out 2019 in total bliss! On Sunday, January 6th from 2:00-3:30 PM, join us for this relaxing experience. A sound bath is an immersive listening experience where participants relax and open in a Yin pose, while crystal singing bowls and chimes are played. The experience can facilitate deep relaxation, mental clarity and a meditative state among participants. This article can help you with some tips on creating a yoga practice that better protects your neck and shoulders. Implementing the following tips, on and off the mat, may just support you in releasing blockages and finding ease. Our number one recommendation for a more mindful holiday season is to fill your cup before giving to others. We all know it’s harder to see the good if we’re run down and not taking care of ourselves. If you keep your self-care routine on point over the holidays, you may just find a little more ease in those family gatherings! As a Registered Nurse and a yogi it seems natural that I am drawn to Ayurveda, the science of life. Ayurveda is one of the oldest and continuous holistic systems of medicine, acknowledging the unity of mind, body and spirit for true wellness. Personally, one of my favorite aspects of Ayurveda is in the way the science acknowledges the elements and influences of our natural and energetic world in our lives. In the study of Ayurveda this time of year is known as Vata season. It is governed by the natural elements of air and ether which translate to movement. This is easy to understand as the qualities of this time of year are cool, dry, windy, shifting, often unpredictable. In order to stay balanced during this time of year, it is helpful to cultivate the opposite, warmth, moisture, stable routines, slowing down, nurturing self-care. When we don’t honor the season with these practices, the energy of Vata can become excessive resulting in feeling of unsettledness, insomnia and anxious feelings. Yoga for everyone! Beginners Series with Julie. Yoga for All! Julie, a Soul Strong Yoga teacher and co-owner, is passionate about bringing yoga to all people, all bodies, and all levels. She is honored to introduce students to the amazing health benefits yoga provides for both the body and mind in a small group setting. This class is capped at ten students to ensure that the group is provided individualized attention. $75. We will meet at Soul Strong Yoga on Fridays from 10:30AM - 11:30AM, November 30th - December 21st. Soul Strong Yogis, I write to you this week from Dharma Ranch in San Marcos, TX. I’ve taken myself on a solo-getaway for some...meditation. At first, I was calling it a vacation, but then I got here and how have I spent my time? Meditating, to be quite honest. To many, it would look like a truly boring vacation. It’s just been a time of sitting, doing nothing, thoughts arise, I come back to the breath and my surroundings, walk in the woods, thoughts arise, come back to the breath. I’d say my chakras are pretty damn aligned out here. Now while taking time for yourself can make it easier to find this flow, the truth is, you can tap into this kind of peace WHEREVER you go. Through yoga we seek to steady the fluctuations of the mind. The word yoga literally means “to yoke” or “union” and the practice itself acts as a bringing together of the physical, emotional, intellectual and spiritual bodies. Understanding the chakra system can be one of the most transformative yoga practices for living a more embodied life. Yoga postures move stagnant energy in the body. Chakras are simply energy centers up and down the body that fluctuate through states of balance and imbalance. For example, an imbalanced heart chakra may cause you to be closed off, unable to receive love, and living from a place of fear. A balanced heart chakra openly accepts love, has healthy boundaries, and lives from a heartfelt place. Or when you’re ticked off in traffic? That’s your root chakra taking over, pulling your body into fight or flight for your survival. By understanding the chakra system, your practice automatically becomes more intentional. And being in touch with your own chakras will aid you in finding ease in the body no matter the circumstances. To sign up for The Warrior Within on November 10th 2-4PM, click HERE. For more information on Chakras, check out the following links! Join Amanda on a Power Vinyasa journey through the Chakras. Reigniting each chakra while helping you unlock your own tools to embrace the powerful warrior that dwells within you. Amanda Leigh Oakley is fueled by the sun and powered by a wild heart. Based in Austin, Amanda specializes in all levels of Power Vinyasa. She strives to teach and execute a stimulating and dynamic practice that stays authentic in fluidity, physicality and emotion. Endeavoring daily to lead with love and authenticity, she gently propels her students into taking risks and challenging themselves. Her classes are invigorating for the soul and strongly rooted in alignment and the foundations of each posture. Amanda is a heart based explorer who loves to inspire her students to keep diving deeper into the relationship with their breath, heart, body and spirit. Yoga Therapy for Anxiety - In this practical workshop, you’ll learn how to identify and move anxiety through the body and mind using the tools found in Yoga Therapy. The workshop will begin with an informative group opening where members of the group can connect based on shared experience involving anxiety as a felt sensation in the body. Students will then learn how to use yoga and the tools found within the eight-limbed path of yoga to recognize and release anxiety from the physical body. The workshop will be 2 hours in length, and will cover yoga asana (poses), pranayama (breathwork), meditation, and visualization. Participants can expect to leave with practical, discrete tools that can be implemented to help manage anxiety throughout the day. If you don’t already know Alfonso, the instructor leading our Yoga Workshop in Spanish on Sunday the 21st, then you’re in for a treat. 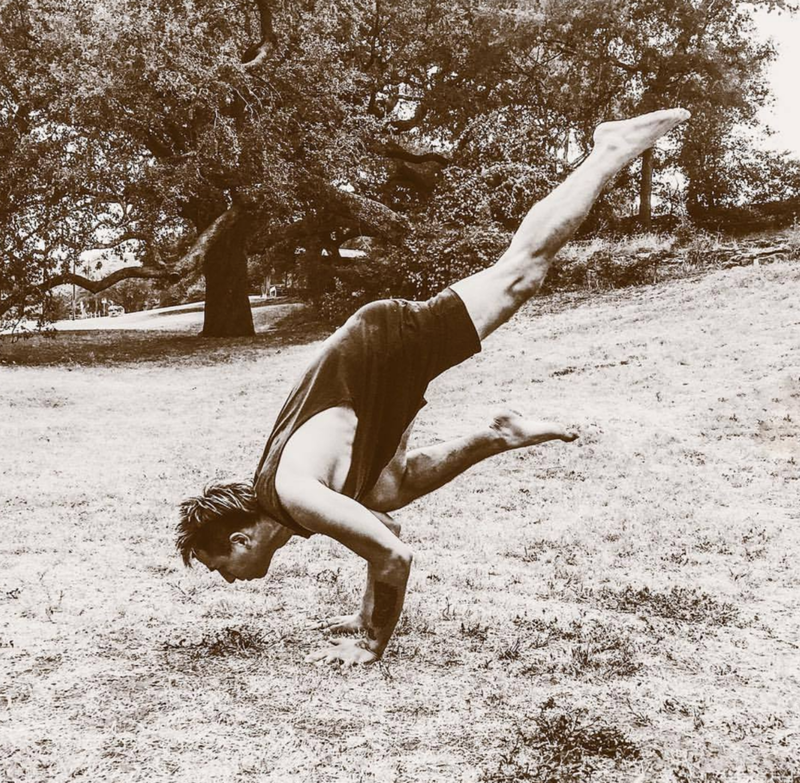 Alfonso’s presence is a staple in the Austin yoga community. Once you know how to spot him by his signature hairstyle (he’s also an amazing hairdresser! ), you’ll start seeing him everywhere & realize he teaches & practices at studios all around town. Alfonso has a way of making perfect strangers feel at home, so when I met him in teacher training in 2017, it only seemed natural that he’d be my first friend upon moving to Austin. Since his 200 hour teacher training, Alfonso has gone on to study his 300 hour at Sukha Yoga, & teaches at Black Swan Yoga & Stretch Yoga. First, I asked Alfonso: What should students expect from this workshop? Students should be expecting more of an alignment based class. It will be a class with basic asanas with suitable alignments for each individual student to reach their full possible expressions. My overall purpose is for each student to become familiar with the basic yoga postures and to set students up for success to venture into a yoga class on their own and to have some sense of familiarity in unknown spaces. The class will also be dictated by the questions asked by the students. Tell us a little more about YOU! What is your practice and/or teaching style like? What has it been like learning yoga postures in Spanish vs. English for you? I would say that my practice and teaching style has evolved into creativity and awareness. Creativity in movement but also with a deep attention to alignment to create expression with lines of energy. Translating cues has been a fun challenge because of the sentence structures from English to Spanish so it’s going to be fun. And finally, I asked: what inspired you to teach this workshop now? This workshop is close to my heart. To me yoga is a universal, the body isn't a language, it's an expression. I want this workshop to be a foundation for people to be able to go to a class even when English is not their mother language. Book Taller de Yoga en español HERE. Only $25. To learn more about Yoga in Spanish, check out the following links! Every Tuesday and Saturday from 9:30-10:15 AM, Soul Strong Yoga gets a little louder, a little more playful and the students get a little more...little! Yoga With My Toddler has been a wonderful addition to our schedule & I’m so excited to share more details with you. Whether you’re a regular at the studio, or new to our Soul Strong fam, you may be curious what this 45 minute parent/caregiver & toddler class entails. Check out the interview below with studio co-owner & yoga instructor, Julie Afsahi, for more! 1) What are some of the benefits of Toddler Yoga? How does the class access these? The benefits of bringing yoga to young children and their caregivers are broad and oh so great. First and foremost, children get to spend quality time with caring adults, adults engaging in meaningful exchanges, play, and conversations. These high-quality interactions foster greater confidence, language skills, and joy in children. Also, the caregiver (parent, grandparent, nanny, etc.) reaps the benefits of tearing themselves away from the busy outside world, getting to stretch, play, laugh, and tapping into their true, bright inner selves. All participants increase both this independent sense of inner joy while also building community and joyful moments shared between all. Toddler Yoga is built on a foundation of play. Through play, we build a yoga practice. We sing, we dance, we stretch, and we breathe. Children become more mindful of their breath, learning to regulate emotion with deep breathing, even at very young ages. Caregivers also practice their breathing right alongside the children, helping adults breathe through stressful moments with children, a great practice for when the going gets tough outside of the yoga studio. We of course are physically active as well. Did I mention that sometimes we do boat pose all the way through Row, Row, Row Your Boat or bear crawl across the room? It can be a workout! 2) What can a child & parent expect when headed to Yoga with My Toddler? Yoga with My Toddler is a yoga class for caregivers to attend WITH their toddler(s). This is an interactive yoga class for all participants. Everyone practices together. Adults and children should wear comfy clothes that you can move it. Get ready for touching your toes, reaching high to the sky, jumping, and stretching. We have all of the yoga props you will need at the studio. No need to bring a mat for Yoga with My Toddler. 3) Any ideas on how to bring the practice of yoga into daily life with a toddler or child? What are some of the biggest takeaways? Much of Yoga with My Toddler can be brought into the home or even car in very practical ways. We are happy to share the songs with you that we sing and do yoga to in class, which you can play on your own. Families can create a yoga space at home, for children to practice their poses, and invent their own. You can place a mirror in their home yoga space, to watch their bodies take the shape of lions, cobras, and trees. Also, in Yoga with My Toddler, we often have a quiet portion or take savasana - these skills that we build around winding down are wonderful to use at naptime or bedtime. We can also offer book recommendations to purchase or checkout from the library to continue the fun at home. For example, Yoga Bear: Simple Animal Poses for Little Ones by Jane Hinder is an excellent board book your child can use to mimic poses from pictures or for you to read together. 4) Any advice for the parent of a shy child or a child that may just be hesitant about coming to a group class like this? Children being suspicious of new people, hesitant to join in, or cling to their caregiver is totally normal and totally developmentally appropriate! We absolutely do not force children to do anything they don’t want to do, but eventually, they will want to join in the fun! Through getting down at a child’s eye level, having interesting props, and a back pocket full of engaging yoga activities, we engage even the most timid of yogis. Remember to sign up for your next class HERE. Recommended age rage: 18 months - 3 years old. $5 per additional toddler. No yoga experience necessary. Drop-ins welcome! And check out the following links for more information on Toddler Yoga! Top tips for keeping your yoga practice safe with The Mobile Athlete, Andi Lozano.